Just want to say that this book is out. Again. It was released previously in deluxe slipcase edition Dec 2010 and went out of stock quickly, very typical when you see Moebius' name on the cover. So this new edition doesn't come with the slipcase, but is more affordable, and more importantly, available. The colours are well restored from the original series, and the story is enjoyable. It really reminds me of the movie The Fifth Element, not the plot, but the overall feel of how a sci-fi world is like. One of comics' greatest masterpieces illustrated by Moebius and written by Alexandro Jodorowsky. Together they present the classic adventure of sci-fi detective John Difool, a low class detective in a corrupt world. With the great darkness attacking the galaxy, John Difool races through the cosmos with his companions, which include his pet concrete bird, Deepo, and the Universe's greatest warrior, the Metabaron. - Amazon product description. 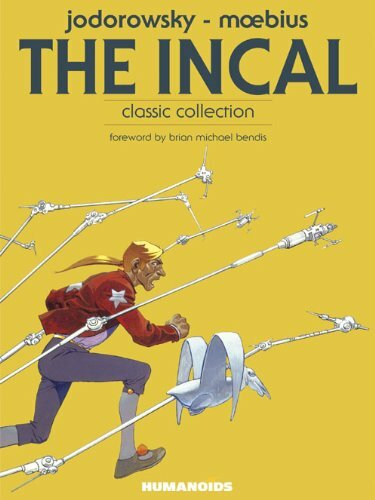 The Incal Classic Collection is available at Amazon.com currently. Judging from the pics, it looks to be very moebius-esque. Looks very interesting, but feels like some panels are not of the same level of rendering as the others? @orange3D: well Moebius draws like Moebius :-) The style is very different from first books to last because Moebius draw this when he had time (between two Blueberry) and he tried different kind of style (the last ones are very "comics" as they came after the Silver Surfer art). Well, it's not a very "definitive" edition as I can see the Moebius hand written "resumes" are not showing (for Métal Hurlant readers and in french first editions) and they changed the font for the titles. When I saw the pre-oder price for the oversized hardcover with slipcase edition, I was doubting whether to spend that much to buy one....it was well worth it!! The art is an absolute treat and a great story to read too. I would say the style varies in this book but I wouldn't say that's a variation in quality at all. It's that experimental spirit that meant he could produce this amazing art in such quantities. I think he often had to resist quantity and try to focus on quality or what you might call economy. The last two books definitely have a different style, much more finished in a way and also full page to add to the difference.